I got the gnome into the rocket! It ended up being fairly easy, with only a few difficult parts that made me want to punch something (like being chased by a helicopter in a vehicle that was not built to carry gnomes). I had mentioned this project in an earlier post, but I just decided to move it here with the remaining screen shots. This is where I found him, underneath that shelf in the middle left of the picture. This was a trimph./ I’m making a note here, ‘huge success.’/ It’s hard to overstate my satsifaction! 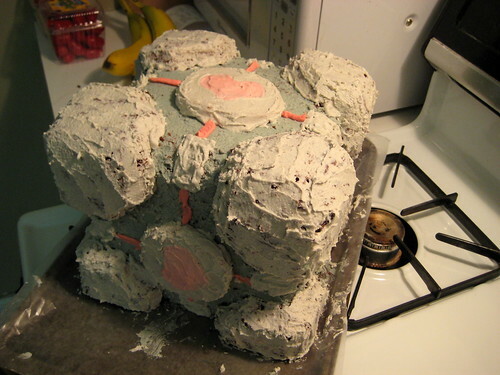 After hours and hours of sweating over a hot stove, the companion cube cake (technically a giant brownie) has been completed! So it’s some serious cake. The dimensions are 18 x 18 x 18 centimeters, excluding the giant corner pieces. If you want to follow the construction saga, read on! Ye Olde Halfe Life. And a Gnome. I decided last week that it was about time I played through the original Half-Life games again. I had finally gotten to play through Episodes 1 and 2 of Half-Life2 just a few short months ago, and wanted to see if the backstory still made sense and actually built up to the plots of the newer ones. I finished regular Half-Life this weekend, and followed that with Blue Shift (which is an impressively short game). So far, everything matches up and makes more sense after playing the new games, and it was a lot of fun going back to this piece of my history that I have always looked back at so fondly. I haven’t started Opposing Force yet, but likely will soon. This got me onto a Valve kick, and so I revisited Portal and Episode 2 to see what Achievements I had yet to make. The Achievements are something new for TF2, Portal, and Episode 2, where you are given random little tasks to try to complete. For example, in Portal you can try to destroy every video camera in the game (I managed to find all but three), fall 30,000 feet (which I did by lining up one portal above me, one below, and then fell for 15 minutes while I read Ayn Rand), kill one turret with another, etc. You also get achievements for beating the Advanced levels, which I have yet to finish (they’re friggin’ hard). 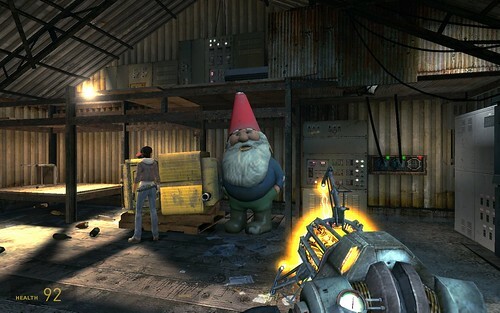 One of the more challenging and bizarre Achievements is set forth in Episode 2: carry a garden gnome through the entire game and then stick him in the nose cone of a rocket (the task is called “Tiny rocket man” or something similar”). I decided to do it, and put the game on easy to make it take less time.